January water levels are expected to be 8 feet (2.5 meters) above the point that triggers a drought-shortage declaration on the lake, according to a 24-month projection by the water system management agency. “That’s good news for everybody in the basin,” said Chuck Cullom, manager of Colorado River programs for the Central Arizona Project, which uses water from the river. The Arizona system serves a heavily populated region that includes the state’s largest cities: Phoenix, Tucson and Mesa. The project would be among the first hit by cutbacks in the event of a shortage, although officials say farmers would be affected before cities. The report is a turnabout from a year ago, when the Bureau of Reclamation projected a 50-50 chance the lake would fall just below the shortage point of 1,075 feet (330 meters) above sea level. Under interstate agreements governing the river’s use, a shortage declaration would force officials to cut some water to Arizona and Nevada. No official shortage has ever occurred. Overall, the river serves more than 40 million people in cities, farms and tribes in Arizona, California, Colorado, Nevada, New Mexico, Utah and Wyoming. Mexico also gets a share. Conservation and water-banking programs involving Mexico, California, Arizona and Nevada were another big reason the largest constructed reservoir in the U.S. will not fall below the drought shortage point, Davis said. Water banking allows users to leave some of their water in Lake Mead for later use, with restrictions. Combined, conservation and water banking have added about 10 feet (3 meters) to the lake level. “That’s substantial, and I think great evidence of the fact that water conservation is possible and can help protect water users from shortages,” said Jennifer Pitt, Colorado River Program director for the National Audubon Society. “I think it’s a promising sign for the future. It probably needs to be scaled up,” she said. Cullom, of the Central Arizona Project, agreed that more will be required in the future. “The persistent drought on the Colorado River system has forced us to look long and hard on how we use water and what the long-term future of our reliance on the Colorado River brings in the face of a warmer or drier climate,” he said. Snowmelt from heavy snowfall from mountains in Colorado, Utah and Wyoming also boosted the lake’s water level. The report projects a 31 percent chance of a shortage declaration in January 2019. A 1922 interstate agreement allocates a combined 15 million acre-feet of water to the states and Mexico. An acre-foot is about 326,000 U.S. gallons (1.2 million liters), enough to serve two typical homes for a year in the U.S. West. More than 16 years of drought have taken a toll on Lake Mead, which is currently just 38 percent full while farmers withdraw water to irrigate summer crops. But Lake Powell, another huge reservoir on the Colorado River upstream from Mead, has improved to 63 percent capacity. That will provide options for water managers who control the water flow from Powell to Mead. A drought shortage declaration would cut 11.4 percent of Arizona’s promised 2.8 million acre-feet (3.4 trillion liter) allocation, and 4.3 percent of Nevada’s 300,000 acre-feet (370 billion liters). The amount of water at stake combined would serve more than 625,000 homes. 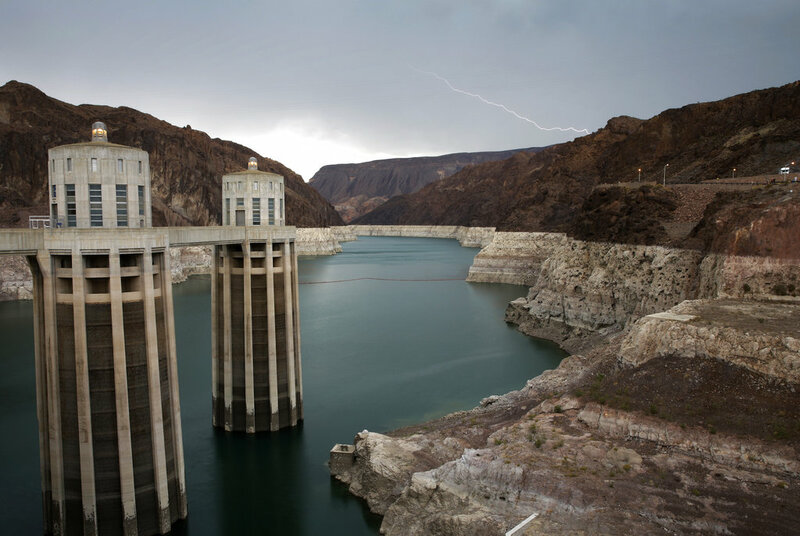 Las Vegas, which draws 90 percent of its water from Lake Mead, might not feel much effect from a shortage because conservation and reuse have cut the city’s consumption by about 25 percent, Southern Nevada Water Authority officials say. Even if a shortage is declared, California will be able to draw its full 4.4 million acre-foot allocation from the river. Written by KEN RITTER and DAN ELLIOTT, Associated Press. Dan Elliott reported from Denver.